Over this time, Kikkoman has honed the quality of its soy sauce through use of the best technology available. Today enjoyed in over 100 countries around the world, this high quality product is still manufactured according to ageless tradition – a process unchanged from times of old, and one that can never be rushed. The flavour of traditionally brewed soy sauces involves five different tastes that are harmoniously integrated into one: sweet, salty, sour, bitter and savoury. This subtle balance is what gives Kikkoman Soy Sauce its delicious taste – the sensation of umami which the Japanese describe as “more than delicious”. Soy sauce is particularly rich in naturally produced umami components generated during brewing. These umami components are composed of about 20 different amino acids produced as the koji mold dissolves the proteins contained in the soybeans and wheat. The traditional fermentation process utilises microorganisms such as lactic acid bacteria and enzymes – elements that produce Kikkoman Soy Sauce’s full-bodied flavour and rich aroma. In contrast, Chinese soy sauce undergoes very little fermentation; it has both weak aroma and flavour owing to the lack of this fermentation, and to cover these defects, MSG and other additives are used. Both of these products are called soy sauce — yet the two are completely different, not only in flavour and aroma, but also in terms of their ingredients and production processes. In the final step of the fermentation process, Kikkoman Soy Sauce is heated to consolidate its appealing colour and distinctive aroma. 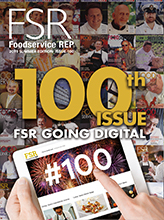 The winning combination of these properties make it a favourite of foodservice professionals and consumers alike. 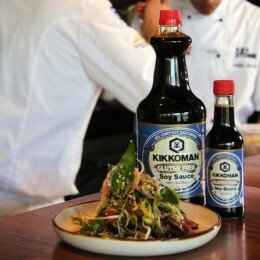 Kikkoman Soy Sauce harmonises with food to produce a marvellous flavour, with the five tastes transformed according to ingredients and cooking methods. When heated, it produces an appetite-stimulating aroma, removing fishy odours and helping to prevent the proliferation of bacteria in food. Depending on the type of food, Kikkoman Soy Sauce can make sweet food sweeter, or moderate the saltiness of salty food. With such beneficial properties it’s no wonder Kikkoman Soy Sauce is the seasoning of choice among foodservice professionals in all manner of establishments throughout the world. Backed by Kikkoman’s commitment to tradition and the natural fermentation process, Kikkoman Soy Sauce represents the pinnacle of soy sauce evolution and as such is the ideal all-purpose seasoning for any cuisine on the foodservice menu.